Join me in my garden! 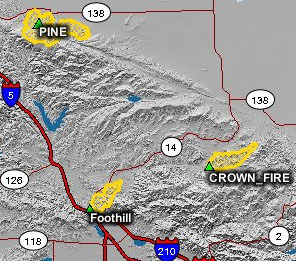 It seems the wildfire season is starting early this year here in California, so I am posting (what seems to be) my yearly posting on California Wildfire Information available via the web. 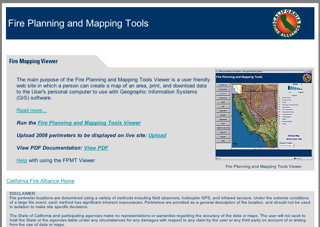 These services provide detailed information including fire perimeters, weather info and more. I will update this regularly as I locate new resources for the coming year. 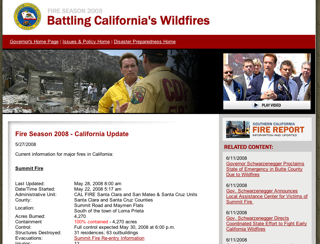 Looking back, I see that I have re-posted this entry almost every year since 2003. Firestorm from powrslave on Vimeo. It looks as if the bees and/or moths did their job and pollinated my Sprite tomato plant. It was the first one to flower and now I see fruit beginning to form. What's that on the roof? As I sat at my computer, it sounded like a couple was dancing right over my head. I was too heavy and moving too quickly to be our usual opossums, and we have recently evicted most of the rats in the yard, so it could only be one thing....raccoons!!! While I had heard of people reporting raccoons in the neighborhood, I hadn't seen one until last Christmas when I was out on a nighttime walk. These 2 were pretty large, a good 2 feet long from head to the base of the tail. I pulled out a flashlight and soon found 4 yellow eyes staring back at me. They lounged around on the roof for a while and then finally shimmied down the podacarpus tree that edges the tall part of the roof. It is amazing how much noise they made on the roof top and how easy to tell it wasn't some of our other typical garden animals. I couldn't get any pictures, but now I will be on the lookout for them and try to grab some if they return. A small, yet excellent, book on all things composting. Good information on a variety of methods and Thompson works hard to dispel various composting myths. Excellent layout and photos add to your reading enjoyment. Our garden is fairly unique for the San Fernando Valley area of Los Angeles. We have no lawn at all, 5 mature trees and many smaller ones. This means that instead of lawn clippings we are constantly dealing with piles of leaves and limbs from both the deciduous and evergreen trees. We regularly fill both our compost bins and our one garden waste bin every week. If we have to do a major cleanup or pruning, we often have leaf piles lying around until trash day and it can even take 2-3 weeks to get rid of it all. Enter Troy-Bilt. Someone at the company came across A Gardener's Notebook and was kind enough to offer up a Chipper Shredder unit to review. I knew immediately that I could certainly put a chipper shredder through its paces. We still had a ton of leaves and limbs from the Fall, so we started gathering everything together in anticipation of its arrival. 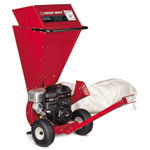 The Troy-Bilt CS 4265 2-in-1 Chipper Shredder arrived a little over a week later on a small pallet. My wife, who accepted delivery could not believe the size of the box and it took a little maneuvering to get it from the driveway to the back garden. The delivery waybill estimated the weight at about 200 lbs. I haven't used a gasoline-powered piece of equipment for years, although at one time in my life I could strip and re-assemble lawn mower engines (and still have them work!). First, I had to go purchase a gas can and some gas. Then I sat on the couch and read the extensive manuals -- one for the engine itself and another for the chipper shredder unit. Everyone I mentioned the unit to immediately made some "Fargo" comment (See IMDB for more info if you've never seen it), and this reminded me to be smart and careful before I used the chipper shredder. ...I think it is going to find a permanent place in my garden. This is an impressive piece of equipment for someone who hasn't started a lawnmower in over 20 years. It is quite large and does take up a significant amount of storage space, We are clearing out a space in the garden shed for it, but getting it into and out of the garage through a common 3' door was a challenge. The discharge chute extends quite far on one side, so I had to move it through the door sideways, leading with the chute and then turning the rest of the unit through the door. The inflated rubber tires allowed the unit to easily move whether in the garden or on pavement. Setting up the unit for the first time was straightforward as virtually everything you need is included. There is a heavy duty bag that can be attached to the discharge chute, goggles and the first filling of oil for the engine. You will want a long necked funnel to fill the engine as it is very difficult to pour into the fill cap with a standard bottle. I ended up making one with an existing funnel and a bit of plastic tubing. The gas tank is situated front and center and was easily filled using my new drip-proof gas can. Setting the choke, throttle and pulling the starter handle was all it took to get the unit to work. The 205cc motor started on the first pull with a slow chug-chug-chug, but quickly spun up to an impressive roar. The unit is loud, so ear protection is highly recommended. It sounds like a dangerous machine and should be treated as such. For our first test, we had a collection of old, dry limbs from a previous pruning project that never made it into the garden bins. They were quite long and we hadn't taken the time to cut them into smaller sections for the bin. The opening for feeding limbs on the chipper shredder is sized so that you can't feed in limbs larger than the recommended size. This is a wise design choice, but it can prevent you from feeding in limbs with odd bends or crooks. You will have to cut them into more manageable sections. These limbs were quite dry and seemed to vibrate in my hand a lot as I fed them through. Quite frequently, as I reached the end of a limb, smaller fragments would be ejected from the feed tube. It wasn't a large problem, but definitely another reminder of the importance of eye protection. The chips produced by the chipper shredder were excellent. They resembled course sawdust and would be a great addition to the compost pile or used as mulch on your flower beds. The unit showed no signs of laboring or stalling even as the limbs reached the maximum rated size. The second test was shredding up an entire garden bin of leaves. These leaves were fairly dry and loosely packed. Dumping the leaves into the feeder by handfuls worked well with no signs of bogging down or stalling. Pouring leaves from a bin directly into the unit was more hit and miss as it is more difficult to control the flow of leaves. Shredding dry leaves did generate a lot of dust which billowed out of the collection sack and coated the ground for about 7'-8' around. The dry leaves probably caused more dust than fresh leaves would, but I highly recommend wearing a dust mask when shredding leaves. Again, though, the mulch produced was excellent. One issue that worried me when getting this unit is that our garden paths are covered in pebbles. Raking and blowing leaves picked up a number of pebbles no matter how careful you are. Rocks and pebbles can quickly dull the blades so I wanted to be as careful as possible. Even so, I am sure I heard an occasional stone go through the unit. While it is certainly not advisable to put stones through it, it seemed to handle the occasional pebble with no ill effects. When the unit first arrived, I thought that it might be a bit large for my use, but after seeing how much it reduced the volume of our garden waste and the high quality mulch it produced, I think it is going to find a permanent place in my garden. Found on my daily walk today. 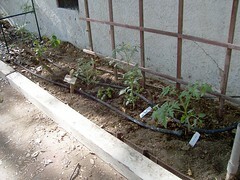 An update on the tomato plants we put in the ground the 2nd week of April -- San Marzano, Sprite and Legend varieties. Click for bigger, more scary, NOM! While they might not be "mountains majesty" they are certainly purple. The Jacaranda trees (Jacaranda mimosifolia) are bringing their spectacular show to the Los Angeles area this week. I find the quite beautiful when in bloom, but some complain about the cleanup when the blossoms drop in a purple carpet on lawns and cars. The Blue Jacaranda, Jacaranda mimosifolia more often known simply as the "Jacaranda", is a sub-tropical tree native to South America that has been widely planted elsewhere because of its beautiful and long-lasting blue flowers. 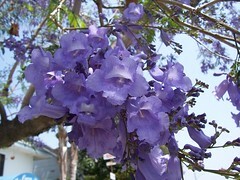 Older sources give it the systematic name Jacaranda acutifolia, but it is nowadays more usually classified as Jacaranda mimosifolia. It is also known as the Black Poui, or as the fern tree. In scientific usage, the name "Jacaranda" refers to the genus Jacaranda, which has many other members, but in horticultural and everyday usage, it nearly always means the Blue Jacaranda. 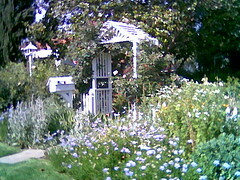 When I moved to Los Angeles 22 years ago, I left behind my grandmother's � acre garden and our own � acre plot behind the house. I thought little of gardening for almost 10 years. Some people are good with houseplants. I am not one of them. So gardening was fondly remembered as something I did way back when. It seemed like everyone in my hometown (New London, Ohio, pop. 2600) tended a garden and I spent my childhood with a hoe in my hand, riding a lawn mower, behind huge rototillers and eventually driving tractors around our small farm. Finally, twelve years ago we purchased our first home and inherited a 10 year old, quite mature, garden. My wife and I typically tended the garden with shovel and hoe, but when I received an offer from Troy-Bilt to review some of their products, I jumped at the opportunity. We have a variety of beds on the property and after 12 years they could all use a bit of TLC. I thought an electric cultivator could help a lot. 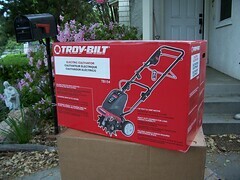 The Troy-Bilt TB145 Electric Cultivator(Click to get more info from the Troy-Bilt web site) arrived in a box about 4'x 2' we found on the porch one day after returning from Little League practice. I was eager to try it out, so like a typical user, I opened it up, set the owner's manual aside (of course) and put the cultivator to use. The only assembly required was attaching the handle, which took about 5 minutes and no tools. The first task was a rose bed that, after being dug up for a sewer line replacement, was buried in tall grass. I had used a hoe to clean out the bed once already and couldn't face doing it by hand again. Thankfully this tool arrived just in time. I was immediately surprised by the power in this small electric unit. I could easily pick it up with one hand, but it was cutting through the grass and quickly cultivating the bed to to 6" or more. Since it is so small, maneuvering it around the existing rose bushes was no problem. The bed itself is probably only about 3 feet wide, bordered by a cement block wall on one side and rustic wooden edging on the other. The long grass would occasionally wind up around the tines, but the cultivator is designed with quick release pins on each end that allowed me to simply pull off the tines, remove the grass and get right back to work. Managing the electrical cord is always a concern with a device like this. (I have cut the extension cord with my hedge trimmers at least 3 times (!!!). The cable management is well designed with a simple clip to hold the extension cord towards the back of the unit and along the handle so it is always in your sight and within easy reach of your hands. For me, personally, this is a great unit that fits well with my environment and I already have 4-5 more jobs waiting for it. The next weekend we brought out the cultivator to work up another small bed where we planned to put some tomato plants. 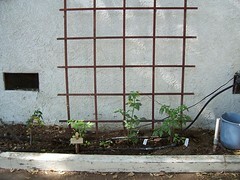 I had picked up 3 seedlings from Tomatomania (Watch the video) in nearby Encino and was eager to get them, and a small pot of basil, into the ground. This bed was even narrower than the first and surrounded by cement on two sides and the stucco of the house on the other. I thought about taking the outside tines off the unit, but the full width ended up being fine. On this bed, I first laid out about 6 cubic feet of compost recently harvested from our old compost bin and then used the cultivator to work this into the existing soil. Again, the unit did a great job and quickly we had a nice, fluffy bed for the tomatoes. The tines handled the inevitable contact with the edges of the cement driveway with no ill effects. The blades showed no damage and simply bounced off the cement. Overall, the cultivator works well as an all-purpose cultivator for a small to medium-sized garden. Those with large expanses of open garden would probably opt for a bigger, gas-powered unit. The TB145 would also be an excellent "second machine" for small beds and hard to reach areas such as annual beds, shrub beds and cultivating between rows in a small vegetable garden. I really hadn't planned on doing much work in the garden today, as it is supposed to be into the 90's by the afternoon. Then I saw that I needed to empty the kitchen compost bin into the larger bins out back. Of course, while I had the lids off, and since it was going to be warm, I might as well soak down the compost bins so they can use the heat to work a little harder. After this I noticed the bird feeders and bird bath were empty, so I might as well fill those, as well. We had user our chipper/shredder for the first time last week and had some excellent mulch. I had the idea that we could use this to dress the rose bed we had recently cleaned up. Then I thought, "heck, we can use the large cardboard box the chipper/shredder was delivered in to underlay the mulch to cut down on the grass. Unfortunately, we needed to soak the cardboard before we covered it with mulch and the hose in that area had been disconnected while some work was being done on the house. After re-hooking the hose, I could see it needed a new washer as it was leaking around the wind-up timer that I use to run the soaker hose. I always keep some washers in the garage, so I replaced the washer and re-attached the hose. 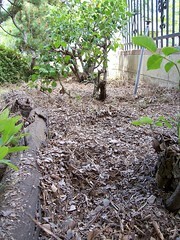 Now, after placing the cardboard, we realized we didn't have nearly enough mulch to cover, so we need to make some more. We had the leaves from a couple of rose beds in the back to work with so we gathered them up. When I went to start the chipper/shredder the engine wouldn't budge. Ok, open the discharge chute and look for a clog. Nothing. Hmmm.. Finally I tip the unit on its back and turn the engine over with my hand. Plonk! out comes one 3-inch long twig that obviously had gotten wedged in exactly the wrong position. Button up the chipper/shredder, put on my goggles and dust mask and fire it up. 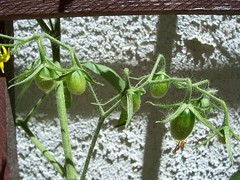 The tomato plants seem to have settled in nicely and the Sprite has about 8 flowers already. I will take pictures on a regular basis to share the growth and (hopefully) harvest of our first tomatoes. LAist points out this upcoming garden event. It is a fee event, but some might be interested in checking out this tour of Green Gardens. This upcoming Saturday, April 26th, marks the 4th Annual Green Gardens Tour, which gives attendees a backstage pass to see six home gardens on the Westside that "demonstrate sustainable designs, practices, and technologies." I am streaming our work in the garden today. Stop on by and say HI! I am not one to grow veggies on my little garden, mainly because it is quite shady and I didn't think they would do very well. That said, Tomatomania (Video) got the better of me and I ended up with 3 varieties and a small pot of basil. (Can't beat tomato with basil, ya know, at least for eating.) -- San Marzano, Legend and Sprite. The Sprite has shown some flowers since I brought them home so I hope this bodes well. See more in the WelchWrite Store!